Stone Mills Township plans to be proactive in maintaining in-person banking services in its municipality — and it may even put its own $8 million in accounts in play to help achieve that goal. On Monday, councillors reacted to notices posted at the Tamworth branch of the Canadian Imperial Bank of Commerce (CIBC) and related correspondence that the bank would close its doors July 11, 2019. 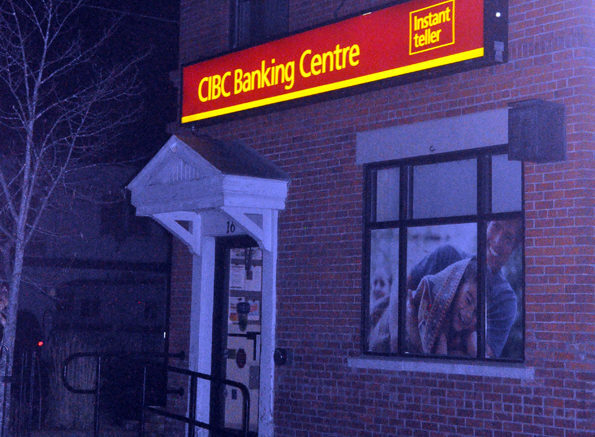 “It’s a pretty sad thing,” said councillor Doug Davison, who recalled the CIBC also tried to reduce services at the branch in 1996. He said through public outcry and the business generated by the eventual amalgamation of Sheffield, Camden and Newburgh into Stone Mills helped keep the branch open. Chief administrative officer Bryan Brooks said through correspondence with the CIBC about a public meeting it scheduled at the township’s Centreville office for Jan. 31, he doesn’t have much expectation of a similar reprieve. Councillors bemoaned the bank’s direction, questioning their understanding of the people they serve. “I know a lot of people are banking online, but there are still so many people who don’t want to do online banking. They want to be at a teller,” said Wenda Lalande. She also questioned if the bank considered the jobs it offered a rural community and the local personnel people trusted. Deputy reeve John Wise said he believed the decision was purely profit driven. Davison said he didn’t wish to wait too long looking for service alternatives. He told his peers the old Sheffield Township hall has a vault and it has good parking, so it might be a good place to start a partnership. “Some place like a credit union might want to work out of there. I do think we should be approaching them,” he said, adding that credit unions have been known to work in small communities with limited populations. Councillors supported a resolution directing staff to seek expressions of interest. Wise indicated he had already brought the matter to the attention of a branch manager within the Kawartha Credit Union who pledged to speak with head office about Tamworth. He also said that credit union is exploring mobile banking services. While Brooks agreed it is a priority for the township to find banking alternatives for its residents, he told councillors they need to be having a discussion about the municipality’s finances, which remain at the CIBC. He said the township has sought a legal opinion on whether it could do its banking at a credit union since the institutions are not directly referenced in the Municipal Act. Brooks said while the township is in a position where it could tender its banking services, it hasn’t in recent years. “We knew that if we moved financial services there was a good chance CIBC would vacate,” he said, adding that previous councils knew they were paying a premium over some prices offered last time they tendered, but they chose to stay local. He said staff would look for council to give a general expectation it would support a banking institution locating in the municipality. Proximity and the security, health, and safety of municipal staff would factor into that decision. For example, he said the township made a $560,000 deposit on a single day last week. To send that kind of money a farther distance, it would require either a delivery service or multiple employees spending time to travel outside of Stone Mills to make deposits. “It’s definitely going to change the way this municipality deals with its finances,” Brooks said. Brooks said his plan is to contact every banking corporation active in this region as well as credit unions, which he called “our most likely alternative.” He planned to work with local and regional banking officials first to see if there would be interest in locating in Stone Mills. Davidson said he could stomach the township waiting for more clarification on its own banking requirements under the Municipal Act, but made it clear he’d like to move sooner rather than later. Also during Monday’s meeting, councillor Kevin Richmond reiterated he’d like to see that Jan. 31 meeting take place in Tamworth, closer to many of the bank’s users. Brooks said he had received similar suggestions for residents and forwarded them to CIBC representatives.